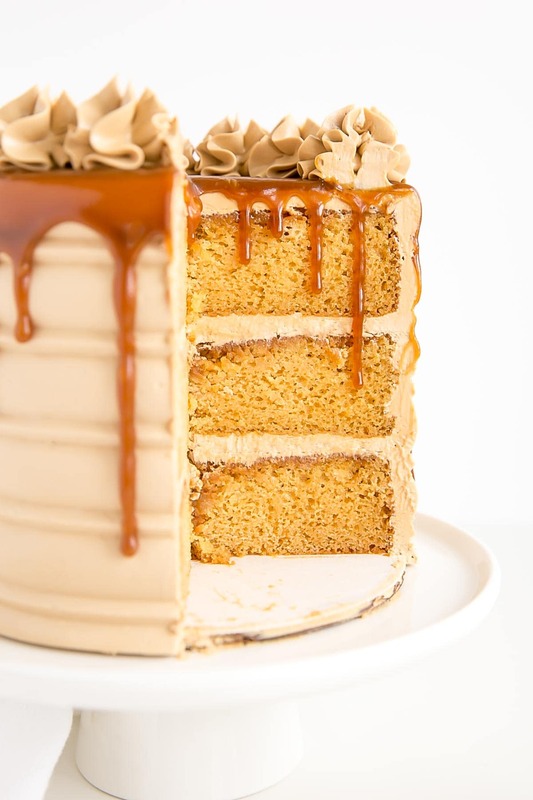 This Caramel Cake recipe is perfect for that die hard caramel fan in your life. 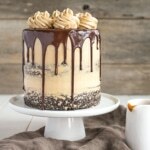 Homemade caramel sauce is used in the cake layers, frosting, and the drip! I am obsessed with how pretty this Caramel Cake turned out. 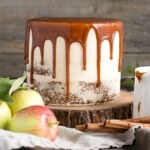 Not only the perfectly smooth cake combed sides, but the caramel drip that was just the right consistency to not drip all the way down and create a hot mess. It’s not often things work out smoothly over here, so I need to celebrate it when it happens! 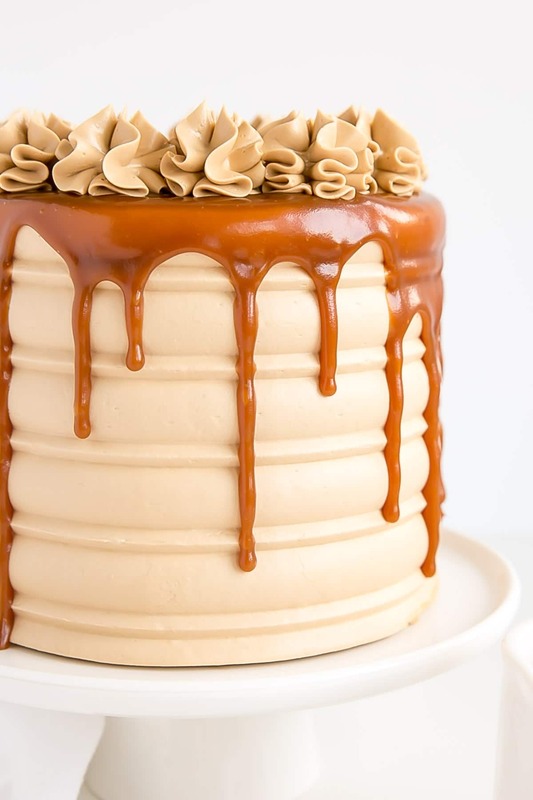 Before we dive into the decorating of this pretty cake, let’s talk about how to make caramel, in case you’ve never done it before. Spoiler: it’s actually really easy! It just requires some attention to detail. There are a number of different ways you can make caramel, but I’m going to tell you about my favourite way to do it. It requires very few ingredients and just a bit of patience. You’ll need the following. Once you have your tools and ingredients ready, place the sugar and water into a pot and stir to combine, but do not stir from this point forward. Stirring will cause the sugar to crystallize, and we don’t want that! Dip a pastry brush into water and brush down the sugar from the sides of the pot (also prevents crystallizing). Place the pot over med-high heat and bring the mixture to a boil. Occasionally brush down the sides of the pot with water to prevent crystals from forming. Continue cooking the sugar until it starts to change color. This can take anywhere from 5-10mins depending on the amount of sugar, size of pot, temperature, etc. I recommend watching the sugar the entire time, as once it starts to color it can burn very quickly. I never take my eyes off the pot while it’s cooking. Okay maybe I do for the first couple minutes or so, but I watch it like a hawk after that. When the sugar starts to caramelize and turn a bit yellow, you can swirl the pot a bit to mix it around. Continue cooking until the sugar is a nice amber color. It will start to smell AMAZING. Immediately remove the pot from the heat and carefully whisk in the heavy cream (pour slowly, whisk quickly). It will bubble up a LOT, so be prepared. Once all the cream is whisked in, add the butter and whisk until incorporated. Return to heat and simmer for 2mins. At this point I remove the pot from the heat and set it aside to cool. You could transfer the caramel to a heatproof container and let it cool that way instead. I sometimes place plastic wrap directly on top to prevent a skin from forming, but it’s not critical. If you do this, be careful, as the caramel is hot. The caramel will thicken as it cools. You can leave it at room temperature overnight or place it in the fridge if storing for longer. If you store it in the fridge, you may need to warm it up a bit in the microwave before using. How do I turn this into a Salted Caramel Cake Recipe? 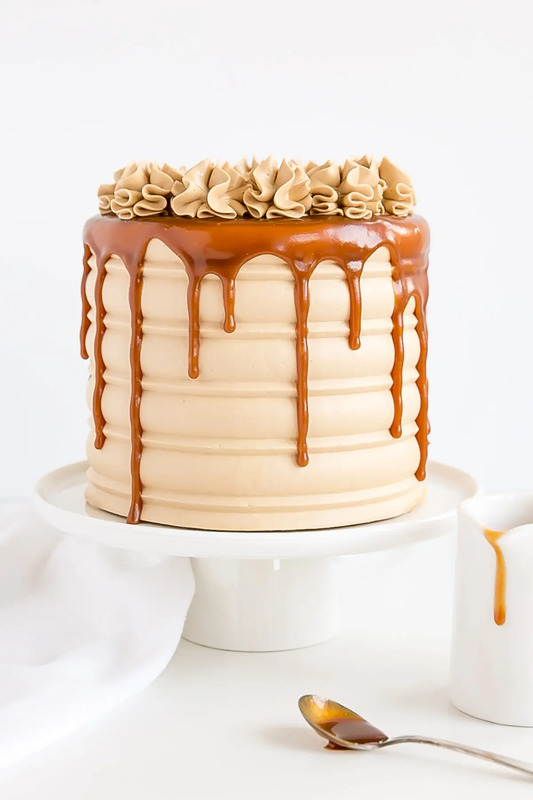 If you’ve gotten this far, it’s really so simple to turn your caramel sauce into salted caramel instead and make a Salted Caramel Cake. All you have to do is add a bit of salt once you’ve finished cooking it. Add some salt, dip a spoon into the hot caramel, let it cool, taste, repeat as needed. That’s it! How much you add is completely up to you. I don’t like salted caramel (gasp) so I recommend starting with less (1/4 tsp) and adding as needed. Ideally use a good quality sea salt. 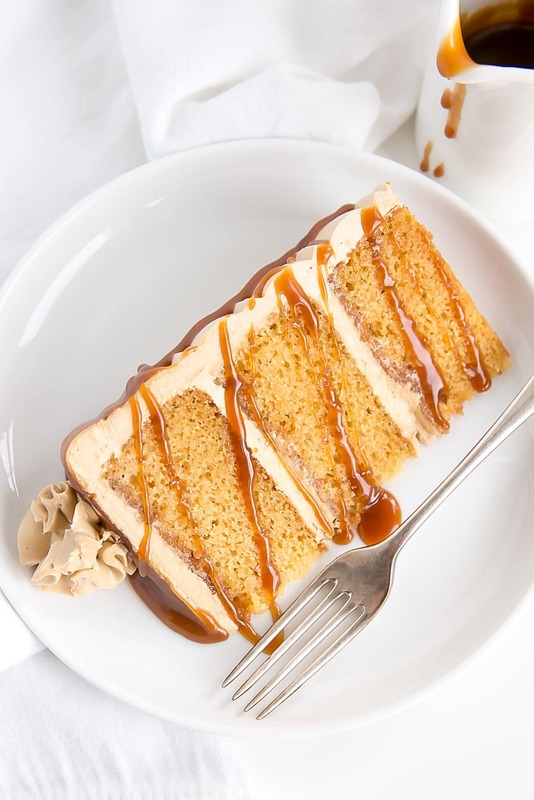 A salted caramel sauce will work perfectly well with this Caramel Cake recipe if that’s what you’d prefer. You’ll want to use a larger pot than you think you’ll need. The caramel bubbles a LOT when the cream is added. At least 4-5x the volume. Brushing down the sides of the pot is important to prevent your sugar from crystallizing — we don’t want a grainy caramel! Don’t take your eyes off the sugar. Once it starts to turn color it can burn very quickly. Do not attempt to make the caramel with cold cream or butter — they must be at room temperature (see below). The caramel will be HOT so handle with care. If you’re making a salted caramel, be sure to let it cool before tasting it! Dip a spoon into the hot caramel, let it cool, taste, add more salt as needed. It is critical that your cream and butter are completely at room temperature. I’ve made this caramel many times before but I didn’t really pay attention too much to the temps this time. Read: I was too lazy to wait for them to come to room temperature properly and figured it would be fine (bad baker!). My cream was straight out of the fridge, so I nuked it in the microwave to warm it up, but my butter was still a bit cold. I went with it anyhow, because I figured it gets heated anyway, right?? Well, the end result was a bit of a mess. The caramel looked like it had come together well, but upon cooling it completely split and separated and kinda curdled. Caramel also does not react well to drastic changes in temperature, so it’s important that the cream and butter are added slowly and are room temperature. I’m sure it didn’t help things that I way overcooked it after I added everything in. Instead of simmering it, I basically boiled it on high for 2 minutes. It was a hot mess, and truly quite disgusting. I should have taken a picture!! Anyhow, I should have followed my own directions, but overconfidence and laziness got in the way and I ended up having to redo the whole thing. I hope all that didn’t scare you away from making your own caramel sauce at home. It’s really very easy, it just requires a bit of focus and attention for 15mins or so. And actually following directions. This caramel sauce is seriously SO good and so versatile. 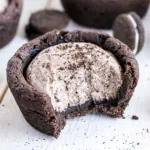 You could use it as a topping for other desserts or ice cream or pancakes… the list goes on! You’ll never look to get store bought caramel again after you try this. 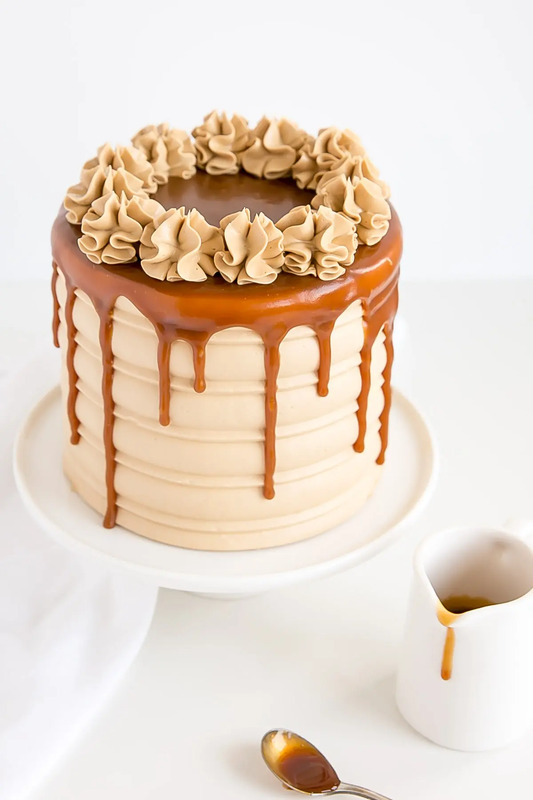 How did you decorate this Caramel Cake? Okay, let’s talk about the decorating of this cake, because I know people are just dying to know and it’s actually really simple. I used a cake comb on the sides. Specifically, I used the right side of the middle comb from this set. After crumb coating the cake and chilling it for 20mins, I frosted it like any cake except that I used way more frosting on the sides than I normally would. I knew I’d be scraping some of that frosting off and I wanted to make sure there was enough to fill in the indents in the comb. Once the cake was frosted and smoothed, I placed the cake comb up against the cake, pressed in a bit, and spun my turntable. I did this like I would if I was just smoothing it with a flat scraper. One long, smooth motion. I had to do this about 10 times or so to get rid of the bubbles and make sure everything looked perfect. As always though, there is a back side to this cake that is less than pretty — specifically where the cake comb started/stopped. I couldn’t completely smooth out the little dent there. Maybe my frosting was a bit soft. If you have any tips on this I’m all ears, I am far from a cake combing expert! If I were making this a Salted Caramel Cake, I would sprinkle some sea salt over the top of the decorated cake once the drips have set. A caramel drip is notoriously difficult to work with. It’s a different consistency than a ganache drip, and doesn’t set as quickly once it hits the cold cake. As such, you actually want it to be thicker than you think you need for the drip. It’s important that the cake is super chilled too. I chilled mine overnight, but only because I was spacing out my baking. A good hour in the fridge should do. My caramel was a bit on the thicker side because I had that in the fridge as well, so I microwaved a small portion of it (1/4 cup or so) in very small increments (3-5 seconds), until I got something pourable but still thick — a lava-like consistency. I did a test drip on the back of the cake to see how it looked. I actually thought it was still too thick at this point, but you need to be patient with caramel — it will keep dripping down. What I thought was too thick actually ended up being perfect. Really, it just takes some practice to know what the right consistency is. Always use a chilled cake though, and make sure your caramel (or ganache) is not warm in any way. I use a teaspoon to do my drip cakes, but you could use a squeeze bottle if you prefer. I like that I have more control with a teaspoon and can be a bit more heavy handed in areas. I prefer drips that are chunky and spaced randomly. If you’re a fan of caramel (and who isn’t??) 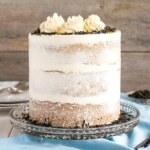 you are going to love this cake! That perfectly delicious caramel flavour shines throughout, and I love that you can actually taste it in the cake layers — I wasn’t sure this would come through, but it does! 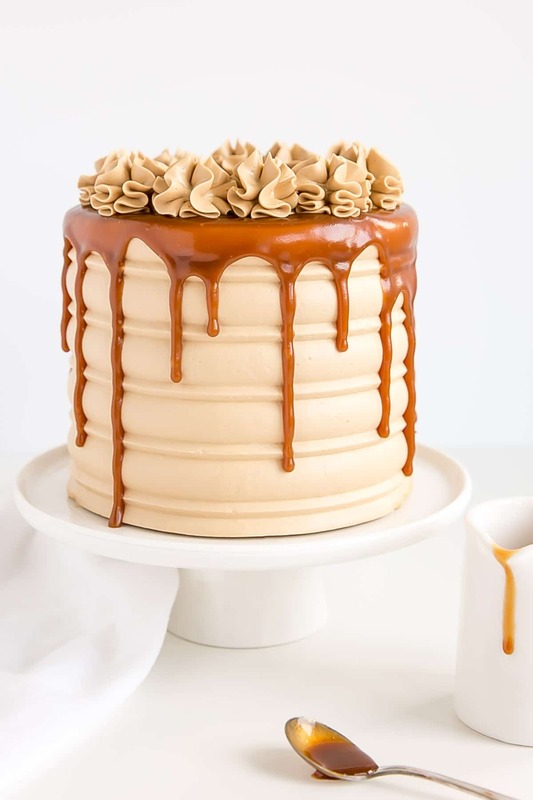 This caramel sauce recipe and caramel Swiss meringue buttercream are some of my faves. You’ll want to be eating both with a spoon!! Looking for more caramel desserts? The recipe as-is will also work in two 8″ cake pans. For three 8″ pans, 1.5x the recipe. To make cupcakes, all you need to do is reduce the baking time — start checking at 15mins or so. The recipe will make 18-24 depending on size. For the caramel, it is critical that your cream and butter be at room temperature. Do not attempt to make it with cold cream or butter — it will separate when cooled. 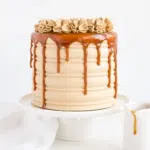 If you prefer Dulce de Leche, you can use that instead in the cake and frosting — it won’t drip as well unless you thin it out somehow. 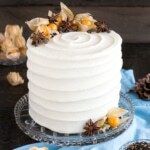 For the texture on the sides of the cake, I used the right side of the middle cake comb from this set. 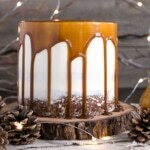 Be sure your cake is well chilled and your caramel on the thicker side before you attempt the drip. 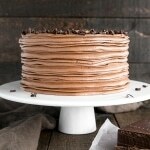 I used dark brown sugar in my Swiss meringue buttercream because I wanted more of a caramel color to it. Granulated or light brown sugar will work just fine too. Cook until desired color of caramel is reached (amber) and immediately remove from heat. Very slowly pour in (room temperature) heavy cream while whisking quickly. The mixture will bubble up (a lot) and boil. Add (room temperature) butter, return to heat, and bring back to a boil. Simmer for 2 minutes whisking constantly. If you want to make this a salted caramel, add your salt at this point. Whisk it in (start with less than you think you'll need), dip a spoon into the caramel, let it cool, taste it, add more salt as needed. In the bowl of a stand mixer combine butter and sugar. Beat on med-high until pale and fluffy (2-3 mins). Add eggs one at a time, fully incorporating after each addition. Add vanilla and caramel and mix until incorporated. Spread batter evenly into prepared pans and bake for 35-40 mins or until a toothpick inserted into the center comes out mostly clean. Add cooled caramel and whip until smooth. *** Add additional salt if desired if making a salted caramel buttercream. Trim cake layers slightly. 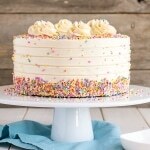 Place one layer of cake on a cake stand or serving plate. Top with 1-2 Tbsp cooled caramel. Spread evenly pressing into the cake layers so the cake absorbs the sauce. Top with 2/3 cup of frosting, spread evenly. Repeat with remaining layers. Frost and smooth the outside of the cake, generously frosting the sides specifically. Smooth with an icing smoother. Use a cake comb on the sides of the cake. Repeat, scraping off more frosting each time, until smooth. Fill in the top of the cake with more caramel and spread evenly with an offset spatula. Pipe rosette dollops using a 1M tip with remainder of frosting. **** If caramel has thickened too much, microwave in 5-10 second intervals until it's pourable (but not warm). You want the caramel to be rather thick for the drips. It will continue to drip down. Made this, and it was great- thank you for sharing the recipe! 1. I made the buttercream as stated, but added a quarter cup more of the caramel sauce to up the flavour. It ended up slightly curdled. It’s super hot and humid here, BTW. Do you think either of those factors might have contributed to its splitting? 2. Is there any specific reason you added as much butter to the caramel sauce? Most caramel sauce recipes have far less butter. I’m asking as I was wondering if I could get away with a typical sauce (about a cup of sugar, a cup of cream and a tablespoon or so of butter) whenever I next make this cake. Hi Salma! 1. Yes, adding too much of it could have contributed there — it could throw off the balance of meringue to butter, to caramel. 2. It’s just how I learned to make it in pastry school. I love it so I haven’t bothered to stray from it! Thank you for replying. 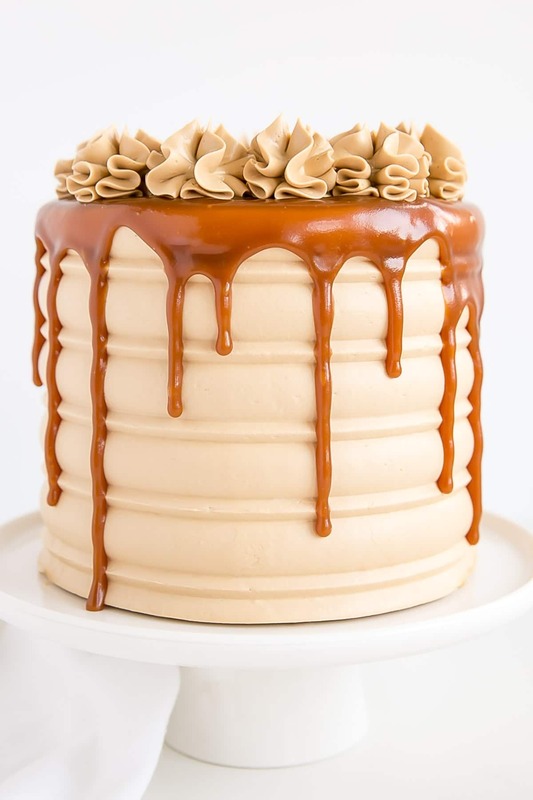 I have to make two birthday cakes soon, and after my overall excellent experience with your salted caramel cake, have been drooling over your fabulous collection, wondering which to make next. Will get back once I’m done. I’m trying to decide between this one, and your Turtles Layer Cake to make for our sons girlfriends birthday…sooo many hard decisions! Also, your pastry brush, which kind do you prefer: the rubber plastic kind or true brush? I like the way the bristled brush paints better, that the rubber one, but sometimes will leave a bristle or two!! What kind do you use? Thanks for all of your hard work, great details and insight, and step by step instructions for us novice bakers! This cake, like all of yours, is perfection. I absolutely adore caramel. Your instructions are clear and really helped me to visualize how to make this. I just upgraded my cheap cake turntable to one that is a pedestal and spins like a top. I can’t wait to practice your decorative sides of the cake. Beautiful, beautiful, beautiful.